This map is a work of art....literally. Welcome to my gallery of fine art with a sheeping twist. Not only will you be able to fly through the paintings and enjoy their beauty, but sheep well enough and you can actually purchase the paintings for your own enjoyment! 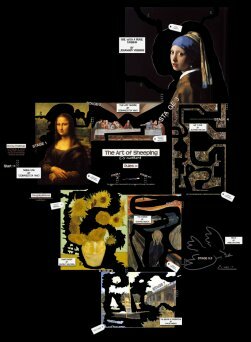 Either take the normal route (and easier) routes, or fly through the £ sign routes to purchase your very own classic works of art. Have fun in my gallery and good luck scoring those pro routes. P.S - I haven't used any magic wands or cropping tools whilst making this map. Instead I have gone round every section, zooming in closely with the path tool and using the artists' brush strokes as a guide to plotting the mazes. This approach made me feel like the actual artists were helping me design this sheep race.